Why are online reviews so prevalent regardless of industry? It’s because we, as consumers, need to be reassured that whatever we’re paying for is going to deliver on its promises. Integrity is at the heart of this. An honest business that stands by its principles is one that deserves to be trusted. But you can’t just say you have integrity – you have to show it. Content is one way to demonstrate your brand’s integrity and, in turn, help your audience trust you. Here are five ways to use content as a truth vehicle. Consumers trust and look up to industry authorities and influencers though they may not realize it or refer to these people as industry authorities or influencers. But influencer marketing has seen its popularity grow substantially in a short time. If an influential figure is seen to endorse something, that “thing” gets instant credibility. The same can be true for you and your content. How do you create this perceived authority? A social share from a respected name in your industry acts as a vote of confidence in the quality of your content, and is a quick and reliable way to gain your audience’s trust. “Like,” share, or comment on their social media posts. Initiate a conversation via email. Simply asking for their opinion or help on something can be enough to get a dialogue started. Bump into them at an event. Set up a phone call or a face-to-face meeting after a few exchanges. I thought you might want to know that I quoted you/linked to you in my recent post about xyz. If you have a minute, it would be great to hear what you think of the piece, and if you like it, awesome if you could share it out! Instead of mentioning an authority based on their previously published insight or general expertise, approach them while you’re writing an article. Ask if they have any thoughts on the topic that they’d like to share with you and your audience. In this context, the more specific you can be in your correspondence, the better. I’m writing a piece about using content to make your audience trust you and wondered if you had any thoughts on the topic you wouldn’t mind sharing? 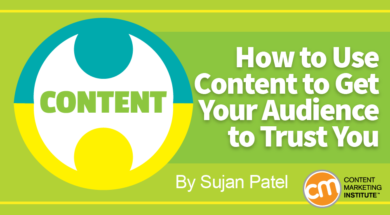 I’m writing a piece about using content to make your audience trust you and wondered what you thought is the very best way to get people to trust your content? It’d be awesome if I was able to quote you in the piece! Will you get a 100% response rate? I doubt it. (If you do, let us know what you said in the comments!) A more realistic hit rate would be about one in five. However many emails you have to send to get the response you want, the impact of quoting recognized, respectable names in your content makes this strategy well worth your time. When people contribute to a piece of content, they’re likely to share the finished piece. More importantly, the simple fact that an authority has taken time out of their day to contribute to your work succeeds in creating perceived authority with your audience. You know about clickbait, right? Titles that make a piece of content sound so enticing you can’t resist finding out more and click, but ultimately are disappointed when you realize the content is far less interesting than the title implied or worse – not about the topic at all? Don’t do that. If you do, you’re lying to your audience. You don’t need to be a psychology major to figure out that lying to your audience will achieve the opposite of making them trust you. Sure, you should craft titles that are enticing and make readers want to click to find out more, but you should never, ever mislead anyone. Always deliver content that the headline promises. Personalizing your content with anecdotes from the authors’ lives and experiences helps your audience relate to what is said, and in turn, helps them to trust your brand. There are a couple of reasons why this is. When you back a statement with personal experience, you add weight to what you’re saying. You instantly become more believable. That second statement is far more credible, right? This tactic also helps your audience see you as a real person with similar emotions, life goals, and problems. If they can visualize you as a person that shares similarities with them, trust follows naturally. There’s more to being honest than steering clear of clickbait. The stories you tell and the information you offer has to be accurate, too. Sharing stories is a great tactic, but only if those stories are true (don’t ever be the little boy who cried wolf). If you fabricate tall tales – or exaggerate a little – to make you and your brand sound more interesting or your content more credible, eventually you’re going to trip up. Don’t have enough factually accurate experiences to share? Don’t make them up – start making experiences. When readers comment on your content, take the time to respond to them properly. Show that you’re genuinely interested in their thoughts, ideas, and comments. Listen to what they have to say. Be empathetic to their problems and receptive to their ideas. Don’t be afraid to be yourself. Someone who is engaging with your content is a strong lead – as a customer or an advocate. Keep things polite and professional, but talk to them like a friend, not a customer. While we are surprisingly trusting of strangers, we naturally come to trust people more as we get to know them (unless they specifically give us a reason not to). Take every opportunity to engage your audience and develop relationships, and if you ever make promises, always follow through. What other psychological best practices do you employ in your content in order to get your audience to trust you? Let me know in the comments. You can trust the CMI newsletter as a reliable, vetted source for helpful content marketing insight, tips, and trends. (And we encourage all our authors to regularly interact with commenters too.) Subscribe today.